Groups are encouraged to register early with an additional incentive of a complimentary registration per organisation, for all groups of more than ten, that register before 31 May 2017. 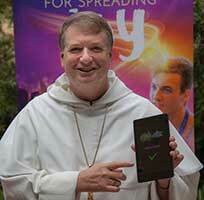 While registering online for the Festival, Archbishop Fisher said, ‘The Festival will be a national expression and joyful celebration of the young Church in Australia. I encourage young people across Australia to go online and register with a local group today or visit the Festival website to find out about other opportunities and the pre-festival competitions’. ‘If you are between Year 9 and 30 years, the Festival is for you,’ he added.